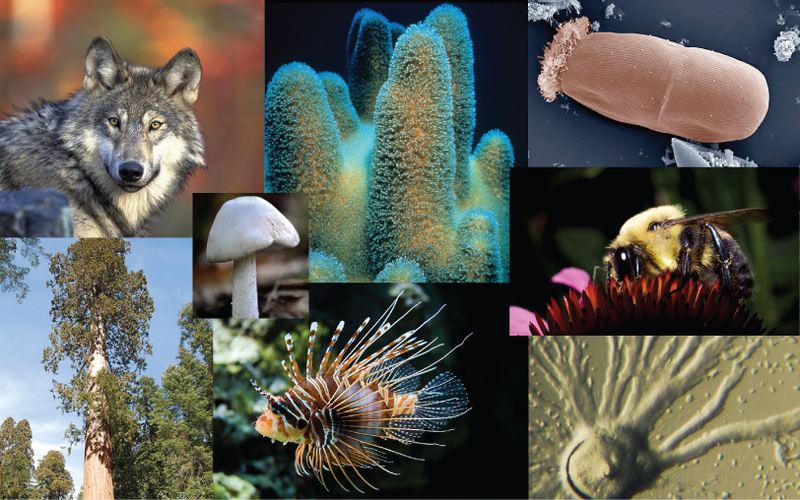 What biological process is responsible for biodiversity? All species —from the bacteria on our skin to the birds outside—evolved at some point from a different species. Although it may seem that living things today stay much the same from generation to generation, that is not the case because evolution is ongoing. Evolution is the process through which the characteristics of a species change over time, which can ultimately cause new species to arise. The theory of evolution is the unifying theory of biology, meaning it is the framework within which biologists ask questions about the living world. Its power is that it provides direction for predictions about living things that are borne out in experiment after experiment. The Ukrainian-born American geneticist Theodosius Dobzhansky famously wrote that “nothing makes sense in biology except in the light of evolution.” He meant that the principle that all life has evolved and diversified from a common ancestor is the foundation from which we understand all other questions in biology. The theory of evolution by natural selection describes a mechanism for how species can change over time. That species change was suggested and debated well before Darwin. The view that species were unchanging was grounded in the writings of Plato, yet there were also ancient Greeks that expressed evolutionary ideas. In the eighteenth century, ideas about the evolution of animals were reintroduced by the various naturalists. At the same time, James Hutton, the Scottish naturalist, proposed that geological change occurred gradually by the accumulation of small changes from processes (over long periods of time) just like those happening today. This contrasted with the predominant view that the geology of the planet was a consequence of catastrophic events occurring during a relatively brief past. Hutton’s view was later popularized by the geologist Charles Lyell in the nineteenth century. Lyell became a friend to Darwin and his ideas were very influential on Darwin’s thinking. Lyell argued that the greater age of Earth gave more time for gradual change in species, and the process provided an analogy for gradual change in species. Figure 2. Darwin observed that beak shape varies among finch species. He postulated that the beak of an ancestral species had adapted over time to equip the finches to acquire different food sources. 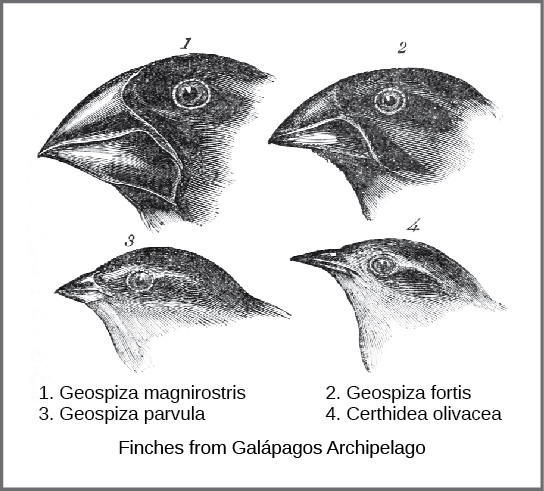 This illustration shows the beak shapes for four species of ground finch: 1. Geospiza magnirostris (the large ground finch), 2. G. fortis (the medium ground finch), 3. G. parvula (the small tree finch), and 4. Certhidea olivacea (the green-warbler finch). Wallace and Darwin both observed similar patterns in other organisms and independently conceived a mechanism to explain how and why such changes could take place. Darwin called this mechanism natural selection. Natural selection, Darwin argued, was an inevitable outcome of three principles that operated in nature. First, there exists variation in traits among individuals within a population, and these traits are inherited, or passed from parent to offspring. Second, more offspring are produced than are able to survive; in other words, resources for survival and reproduction are limited. And lastly, there is a competition for those resources in each generation. Out of these three principles, Darwin and Wallace reasoned that offspring with inherited characteristics that allow them to best compete for limited resources will survive and have more offspring than those individuals with variations that are less able to compete. Because characteristics are inherited, these traits will be better represented in the next generation. This will lead to change in populations over generations in a process that Darwin called “descent with modification.” In sum, we can define natural selection as a process the causes beneficial traits to become more common in a population over time, causing the population to evolve. Figure 3. 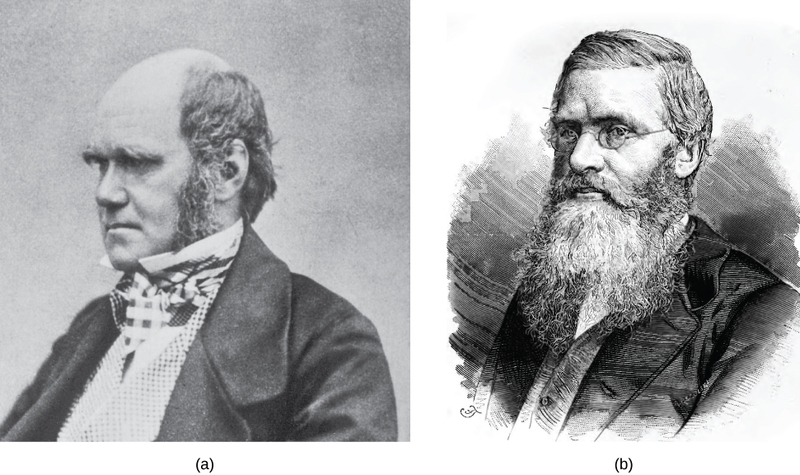 (a) Charles Darwin and (b) Alfred Wallace wrote scientific papers on natural selection that were presented together before the Linnean Society in 1858. Papers by Darwin and Wallace (Figure 3) presenting the idea of natural selection were read together in 1858 before the Linnaean Society in London. The following year Darwin’s book, On the Origin of Species, was published, which outlined in considerable detail his arguments for evolution by natural selection. Natural selection can only take place if there is variation, or differences, among individuals in a population. Importantly, these differences must have some genetic basis, otherwise natural selection would not lead to change in the next generation because there would be no way to transmit those traits from one generation to the next. Genetic diversity in a population comes from two main sources: mutation and sexual reproduction. Mutation, a permanent change in DNA sequence is the ultimate source of new genetic variation in any population. An individual that has a mutated gene might have a different trait than other individuals in the population. Without variation in traits, nature would not be able to select the traits that are best adapted for the organisms’ environment at that particular time. The development of antibiotic resistant bacteria is an example of evolution through natural selection and it has been directly observed by scientists. How does this happen? Imagine a person that has a bacterial infection: their body is being attacked by billions of bacteria. Because there is genetic variation in populations, some individual bacteria may already possess traits that allow them to tolerate antibiotic drugs. When the infected person is prescribed antibiotics, the drug attacks and kills the entire population, except for those bacteria that can resist the drug. These bacteria survive because they had a trait that was beneficial and thus nature selected for it. The surviving population will all be resistant to the drug and continue to reproduce, multiple, and pass down that beneficial trait to all offspring. The population has now evolved because all individuals have the antibiotic-resistant trait, whereas before it was rare. It is important to realize that evolution occurs at the population level and is reliant upon genetic variation that was already present. Without that variation, there is nothing for nature to select for. The rise and spread of antibiotic resistant bacteria is an emerging environmental issue and will be discussed in a later chapter. “Discovering How Populations Change” by Open Stax is licensed under CC BY 4.0. Modified from the original by Matthew R Fisher.